DRUCILLA WALL’s debut poetry collection reflects elusive forces of landscape, history, family, and spirit that resist exploration. Her poems are tinged with humor, embued with a wry sense of human short-comings, and awareness of how small gestures and everyday settings reveal moments of luminous spirit, even in the face of loss. Here is the work of a poet whose vision is always open to the unexpected. DRUCILLA WALL was raised in Philadelphia, Pennsylvania. She received her B.A. from the University of Wisconsin, her M.A. from the University of Nebraska-Omaha, and her Ph.D. in English from the University of Nebraska at Lincoln. She teaches poetry and essay writing, and Native American literature, at the University of Missouri-St. Louis. In addition to poetry, her essays appear in jour nals and anthologies. She has earned awards and fellowships for her work, including the Mar i Sandoz Prair ie Schooner Short Stor y Award, the Western Literature Association Willa Pilla Prize for Humor in Writing, and University of Nebraska Fling and Larson Fellowships. She lives in St. Louis, Missour i, and has spent summers with family and friends in Wexford and Galway, Ireland, since 1985.
to the rush of traffic on the road to town. how to solve this or that, here or there. the river on the tide’s retreat to Wexford. would believe such walks real or even possible. all along the streets like a builder’s promise. where the old hotel once stood. that orchids were in trouble. from submerged cars and corpses? the gateway to the West? This is an exciting new collection by a poet whose storytelling and poetic vision create a keen anticipation for her future volumes. Review: "Blues, wit and haiku" - The Geese at the Gates reviewed by Kevin Higgins. The Galway Advertiser, September 08, 2011. THERE ARE those who say there are too many women poets nowadays. For these reactionary critics all was well in the garden of poetry until it was ruined by feminism and the advent of poetry workshops, which have conspired together to encourage many more women to write poetry. And most of it, shock horror, does not even rhyme. In this context, it’s great to be able to welcome debut poetry collections by three very different female poets; each of which does its bit to confirm that the old style poetry world, in which women knew their supposed place, no longer exists except in the dreams of male versifiers of a certain age. 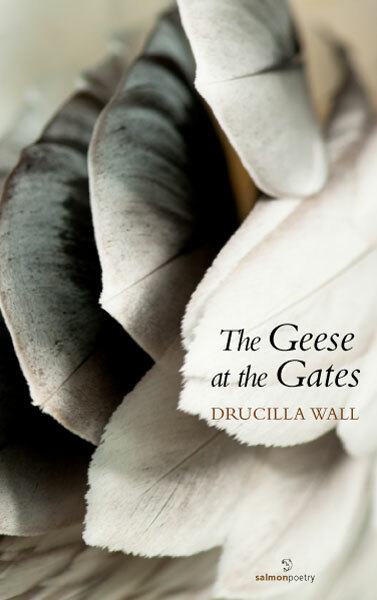 First up is The Geese at The Gates by Drucilla Wall (Salmon Poetry). Drucilla was born in Philadelphia, is part Native American, lives in St Louis, and spends most of her summers in Ireland. Wall writes with great compassion, without ever lapsing into sentimentality, about an America that rarely makes it into poetry. Her language has its own rough beauty. In ‘Cat Revelation’ the cat in question is described as “one fine haven for bugs/and stink.” In ‘On Teaching History’ she gives full vent to the wit that is central to her very appealing poetic style. And ‘Beer Can Chicken’ is simply delicious: “Tell the new girl to dig in./No plates, no forks, just dig in./Dig in before it’s gone./Tear off a piece./That’s the way we roll./Welcome to Kansas.” Drucilla Wall is my kind of poet. At just 30 years of age Ailbhe Darcy is a real rising star of Irish poetry at the moment. I am proud to say that Ailbhe’s first published poem appeared in the Galway based Burning Bush magazine, which I co-edited with Mike Begnal, back in 2000, when she was just 19. In Imaginary Menagerie (Bloodaxe) she shows that she is the most liberated kind of poet. In ‘The mornings you turn into a grub’ and ‘He Tells Me I Have A Strange Relationship’ she writes with great originality and imagination. At times her images shock: “You warn the ceiling,/‘I think I’m having a heart attack.’ Your chest/seems to swell/or contract. You wonder/if you have woken as a fat, middle-aged man,/instead of beside one.” She makes perfect use of line breaks here. Elsewhere, in poems such as the light hearted ‘Socks’ and the at times post-apocalyptic ‘Market Square, Five Years After’ she writes with a subversive humour that’s always threatening to overthrow the world as we think we know it. Imaginary Menagerie is a debut collection of rare accomplishment and polish. Maeve O’Sullivan’s collection Initial Response (Alba Publishing) is made up exclusively of haiku. A haiku consists of three lines and, when written in Japanese, a total of 17 syllables. There are, generally speaking, no adjectives or overt statements. Each line contains its own specific image and the third and final line is meant to turn the poem around, to startle the reader. O’Sullivan has divided the book into 26 different sections with headings such as ‘Autumn’, ‘J’aime Paris’, ‘Nursing Home’, and ‘Tunisia’, each subject having six haiku dedicated to it. One of my personal favourites is in the section titled ‘Postcards From Hollywood’: “Cha Cha Lounge/slumped over the counter—/the bartender”.